Industry Experts released the 2017 version of its United States market report on Ventilation Equipment titled ‘Ventilation Equipment – A United States Market Overview’. The new report also provides in-details analysis of the unit shipments by type for Axial Fans, Centrifugal Fans, Centrifugal Blowers, Power Roof Ventilators and Industrial Propeller Fans for the years 2014, 2015 and 2016. The United States economy is maintaining gradual recovery, and the construction activities are in full swing in both residential and commercial buildings. New residential building permits in the US increased significantly from 2010 and reached 1.2 million units by 2016 with a 2010-16 CAGR of 10.8% and further expected to sustain this growth. Driven by growth in construction sector, trend in implementing energy efficiency standards, and the desire to meet minimum ventilation in homes and commercial buildings will undoubtedly significantly increase over the several years creating opportunities for ventilation equipment manufacturers in the United States. Ventilation product segments analyzed in this study include Axial Fans, Centrifugal Fans, Centrifugal Blowers, Cross Flow Fans, Domestic Exhaust Fans, Power Roof Ventilators, Range Hoods, Industrial Propeller Fans, Air Handling Units (AHUs) for Ventilation and Heat Recovery (HRV)/Energy Recovery Ventilation (ERV) Units. 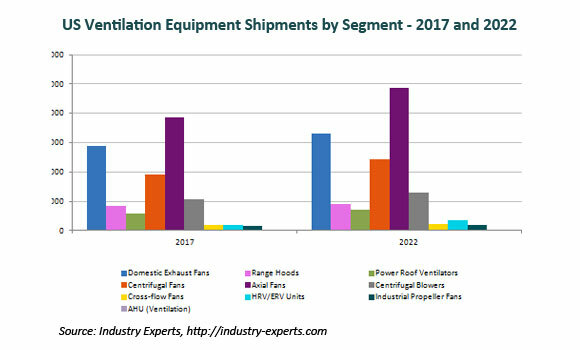 Axial Fans are the leading segment of ventilation equipment in US, with forecast shipments of 7.75 million units in 2017, followed by Domestic Exhaust Fans forecast at 5.8 million units in the same year. This 114 page United States Ventilation Equipment study includes 20 charts (includes a data table and graphical representation for each chart), supported with meaningful and easy to understand graphical presentation, of shipments. The statistical tables represent the data for the Ventilation equipment shipments value (in USD Million) and unit shipments by product segment. The study profiles 12 major market players and 42 other key players that are engaged in ventilation equipment production in the US. The research also provides the listing of the companies engaged in the production of ventilation equipment in the US. The list of companies covers the address, contact details and the website addresses of 76 companies.